Except that maybe they don’t? for pattern, did k7, (k1,p1) 5x, k8 to get correct number of stitches. after a few rows, expanded ribbing section, so pattern is now k5, (k1,p1) 7x, k6. 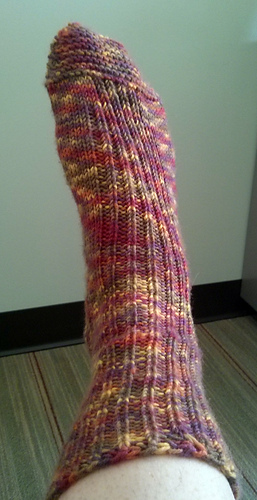 7/16 – started 1st heel too early (as usual), so ripped back heel & last row of heel garter section. Debating whether to pick back any more of that garter or just have a slightly longer garter section at the end of the foot…. 7/23 – about 2in up from garter heel reduced back of leg, ssk k6 (p1 k1) 5x, k6, k2tog. 7/28 – been gradually expanding the ribbing sections, front and back, to taper into a k1p1 cuff. Planning on at least 1” of ribbed cuff. Used this bindoff: http://www.knitty.com/ISSUEfall09/FEATjssbo.php, love the way it looks & feels.